Not From The Cape Dutch Population Group. The Boer people arose on the Cape frontier from the Trekboers who were from the poorest members of the fledgling Cape colony established by the Dutch East India Company during the 1650s who could no longer cope within its "grindingly class conscious" control. An anti-Boer propagandist once erroneously asserted a while ago that the Boers "are Cape Dutch that trekked" but that is a demonstrable falsehood as the Boers developed up to five hundred miles away from the Cape Dutch. The author Oliver Ransford noted within Chapter one of The Great Trek that the Trekboers formed the nucleus of a new nation & experienced a minor population explosion thus cementing their distinction from the Cape Dutch population. The Trekboers started to trek away from Cape society early on in its life: during the 1670s on & emerged on the northern & eastern Cape frontier while the Cape Dutch were coalescing within the south western Cape region. 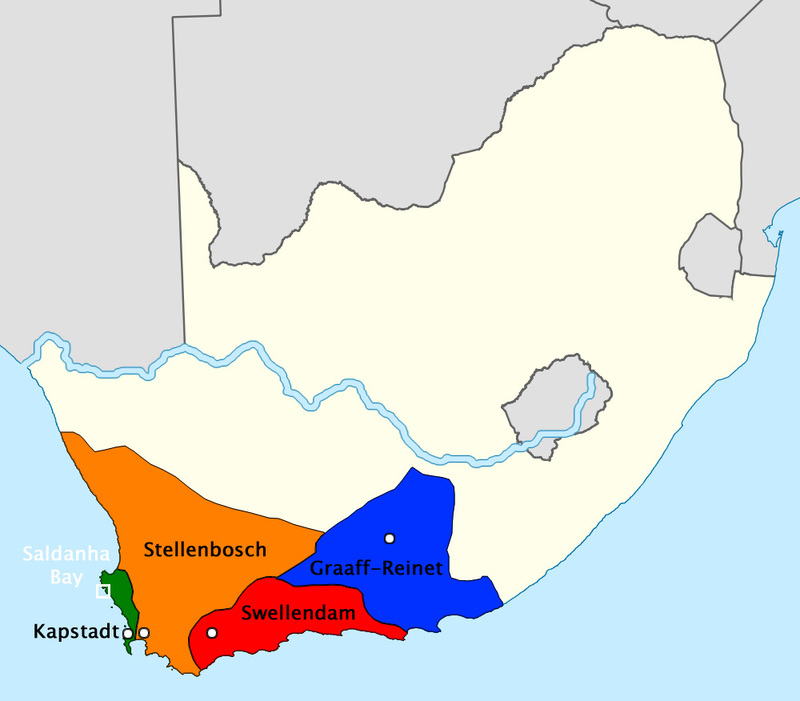 Testament to this is the fact that both groups developed their own unique dialects from the lingua franca [ later called Afrikaans ] that was emerging at the Cape & spoken by all the population groups that emerged at the Cape. Further testament is the fact that both groups developed radically different outlooks. The Cape Dutch were pro Colonial / anti-independence oriented while the Boer people of the frontier on the other hand were the exact opposite: anti-colonial & independence oriented. The notion of republican independence on the Cape frontier during 1795 & then later more notably during the 19th cent beyond the Cape frontier across the Orange River in the wake of British Colonialism - would have been IMPOSSIBLE if the Boers were in fact just Cape Dutch that trekked. Simply because if it were the Cape Dutch that trekked they would have brought THEIR outlook into the frontier & would have been content for the Colonial power to claim the land they lived on as was the case with the British / Portuguese & German settlers of the 19th cent. The Cape Dutch were much more in tune with the Colonial outlook of the aforementioned 3 groups while the Boers' outlook was more in tune with the outlook of an anti-colonial indigenous group [ as the Boers had become ] who were tied to the land & bristled at being controlled at the hands of a Colonial power. The Original Use of the Afrikaner Desigation. The term Afrikaner in current times is often horribly misunderstood & erroneously employed due solely to the mass indoctrination of the 20th cent - propagated by the Afrikaner Broederbond organization that acquired significant control - & the political propaganda that it was based on. The fact of the matter is that this term was appropriated during the latter half of the 19th cent by a Cape Dutch run organization & was then picked up by politicians who originally used the term Afrikaner as a term they used to describe ALL designated White citizens of South Africa who were loyal to South Africa regardless of the home language the citizens spoke. This definition of Afrikaner was widely employed until the 1930s. Politicians from Louis Botha to JBM Hertzog spoke openly of Afrikaans Afrikaners & English Afrikaners often simply calling them all just Afrikaners. Thus the term Afrikaner was not just used to describe the Cape Dutch & then later the numerically smaller Boer people - particularly during the 20th cent after they were conquered after the second Anglo-Boer War - but the term was originally ALSO used to describe the Anglophone population as well. There are 3 books that I am aware of that explicitly note this pertinent fact. Those books are: The White Tribe of Africa from David Harrison. The Rise of Afrikanerdom from T Dunbar Moodie. Boerestaat from Robert van Tonder. The first two books are mixed bags as the authors have an overriding ignorance of the distinction between the Cape Dutch & the Boer people & the significance of this fact. The third book was authored by someone who was well ware of this distinction as he was a son of one of the Bitterenders who voted to continue fighting against the British during the second Anglo-Boer War. Robert van Tonder later became a notable activist in trying to secure self determination for his people - the Boer people - & began advocating for the restoration of the Boer Republics back in 1961 when the Dutch born usurper Prime Minister Hendrik Verwoerd established a nominal & false Republic of South Africa which further prevented the Boers from obtaining self determination. Van Tonder spoke openly about the Boers being a distinct people from the so called Afrikaners since this political term had included the larger Cape Dutch population as well as initially the Anglophones. Today far too many people who are simply ignorant propagate the damaging but erroneous notion that the so called Afrikaners are from the Boers when the truth is that the Boers are the smallest segment [ the Cape Dutch are much larger & its leadership controls the entire population that ascribes to the Afrikaner identification ] of the arbitrary establishment imposed Afrikaner designation. This is a most significant fact when recognizing the salient fact that the Boer people will not be able to secure any authentic form of self determination so long as they are tethered [ politically ] to & claimed by the leadership / academics & personalities of the Cape Dutch population. Map of the First Boer Republic. The first Boer Republic was established in 1795 out of the district of Graaff-Reinet followed a few months later when the district of Swellendam declared itself a republic. Both republics were later conquered after the British took control of the Cape from the Dutch power. A lot of folks often have no awareness of this important fact often erroneously presuming that the first Boer Republics arose during The Great Trek. This fact is important because it is a stark example demonstrating that the Boers have had a long running desire for independence in Africa while the Cape Dutch did not. I have mentioned these first Boer Republics before, but recently found a map outlining the areas where they were as someone made a map of the Graaff-Reinet & Swellendam districts during the era of Dutch / VOC rule up to 1795. These districts were on the Cape frontier where the Boers emerged [ from the Trekboers ] starting just a few decades after the initial arrival of the VOC at the Cape & where the Boer people lived until the Great Trek of the early to mid 19th cent took them across the Orange [ Gariep ] River & then the Vaal River. Map of the districts of the Cape colony under Dutch administration. The districts of the Cape frontier noted as red & blue would become the first Boer Republics in 1795 in opposition to Dutch rule. The Boer people of the Cape frontier were anti-colonial & independence oriented. The red / white & blue horizontal tri color flag was used for both republics of the Cape frontier. Most probably inspired by the flag of the Batavian Republic. For further reading: The First Boer Republic. The Boer people had a republican tradition before the arrival of the British Colonial Power. The Boers Were Not Created With The Great Trek. The Boer people emerged from the Trekboers of the Cape frontier from the late 1600s & throughout the 1700s yet there appears to be a common misconception / erroneous assertion or pronouncement that the Boers got started during the Great Trek of the early to mid 19th cent. This assertion appears to be made by those who have a vested interest in denying the distinct ethnicity of the Boer people from the bulk of the so called Afrikaners. During the era of the Great Trek there was in fact not one monolithic Caucasian Afrikaans speaking group within the Cape. There was a bifurcation which occurred just a few decades after the initial establishment of the settlement by the VOC at the Cape when the poorest members of the society were forced to trek away after constant exasperation with the corrupt VOC administration. This nomadic Trekboer colony was the true origin of the Boer Nation. Not the Great Trek. The folks in the western Cape region were often known as the Cape Dutch [ named by trekking Trekboers who were moving inland ] & whose heartland was in & around Cape Town but found up to Paarl & Stellenbosch. The Cape Dutch were pro Colonial with strong links to Europe who were loyal to the Colonial power & could not understand or relate to the Boers' desire for independence & self determination. The proto Afrikaans speaking folks of the northern & eastern Cape frontier were originally called Trekboers [ named after their trekking & nomadic lifestyle as pastoralists throughout the 1700s ] - a term that was soon shortened to Boer: were anti-colonial as well as fiercely independent & had cut all ties to Europe becoming self sufficient living as nomads in the harsh environment of the Cape frontier. Thus by the time the Great Trek had commenced: the Boer people had existed as a distinct contiguous people on the Cape frontier [ away from the Cape Dutch of the western Cape region ] for at least 150 years with their own customs & dialect. The Boers had already had their first overt freedom struggle in 1795 when they declared their first Boer Republics on the Cape frontier at Swellendam & Graaff-Reinet during a revolt against the VOC. During the 1700s when numerous other new German immigrants came to the Cape: many of them settled directly onto the Cape frontier thus further shaping a distinct origin of the fledgling Boer population to that of the Cape Dutch population. The Afrikaner Broederbond was a semi-secret organization of Afrikaans speakers during the 20th cent which was modeled on Free Masonry that controlled just about anything of importance in South Africa. This organization played a strong role in subverting the long running struggle of Boer self determination & preventing the Boer Republics from being restored. The following are some excerpts further outlining the control they exerted. From: Page 37. Life magazine April 1960. The above quote / admission is from former Afrikaner Broederbond Chairman [ from the early 1930s ] L J Du Plessis within his notable 1960 letter of resignation. Prime Minister J B M Hertzog stated in November 1935 that: there was no doubt that the secret Broederbond was nothing more than the HNP / the Purified National Party of D F Malan operating secretly underground, and the HNP is nothing more than the secret Afrikaner Broederbond operating in public. Quote: [ Afrikaans society and South Africa in general was dominated by a secret Afrikaans organization called the "Afrikaner Broederbond " (AB) or in English the "Brother Bond" since 1948, when the NP first came to power right up until the ANC came to power in 1994. This secret organization which was founded by a group of die hard Afrikaners in 1918, worked much like the Freemasons "help each other" system and has over the years shaped and planned the destiny of South Africa long before these plans became public. The Broederbond ensured that its members, which at its height only totaled just over 12 000, were strategically placed in the civil service (virtually ever prime minister and cabinet member were AB men) and in the private sector so that any decisions it took would always translate into public policy. It was thus a very powerful organization, but with the advent of ANC rule it has of course shrunk in power dramatically. From: Victory or Violence: The Story of the AWB of South Africa. Arthur Kemp. Chapter 3. The Afrikaner Broederbond exerted tremendous control. The Dialect of the Boer Nation. The dialect of the Boers was classified as Eastern Border Afrikaans by historians as that was the location where their particular dialect had developed during the 1700s... on the northern & eastern Cape frontier where the Boer people emerged from the nomadic Trekboers. This dialect was later taken to the region where the various Boer Republics were established [ & beyond ] during the era of the Great Trek. Also later taken to areas now known as Angola & Namibia during the Thirstland Trek. The following are quoted excerpts noting this distinct dialect. Taken from the Afrikaans Language Museum website. The Afrikaans dialect of the Boers is in fact different to the Afrikaans dialect of the Capetonians thus is distinct to that as spoken by the Cape Dutch population. Translated from: Boere vs. die Res. Quote: [ Towards the end of the nineteenth century, however, a political party known as the Afrikaner Bond had been started in the Western Cape. Its publication Die Afrikaner Patriot made a small and shaky beginning, read mainly by the less well-to-do rural readers whose home language was not Dutch but Afrikaans, sneeringly referred to as the patterjots by Dutch speakers. In (this area) one finds the weakest Afrikaans. Ignored by Church and State, these people have been in constant contact with Griquas and Hottentots, who speak a low semi-barbaric form of Afrikaans. We must make a distinction between civilized Afrikaans and the language of the street, playground and servants. Afrikaner intellectuals worked very hard to ‘clean up’ Afrikaans —they appropriated the language developed by the ‘coloured’ lower classes and claimed it as their own, ‘white’ language. They removed black and Malay as well as English influences; for example, many southern Nguni words, which had entered the dialect in the Eastern Cape, were replaced by Dutch words in the new dictionaries devised by teachers and academics, to reinforce the idea that Afrikaans was respectable and ‘white’. On the Rand, where the dominant language of an industrial society was English, working-class Afrikaans was riddled with English-based words. For example, the Afrikaans Garment Workers Union magazine Klerewerker (which promoted the use of Afrikaans) adapted many words derived from English — they used words like ‘werkendeklas’, instead of ‘arbeidersklas’. They also included creative new uses of words, like brandsiek, which was used to describe a ‘scab’, a person who broke a strike by working. But these were lost as they arose out of working-class experiences, and were excluded from official recognition by the middle-class compilers of Afrikaans dictionaries, and magazine and book editors. ] End of quote. The excerpt notes some detail concerning the difference between the dialects as spoken in the Western Cape [ Cape Dutch dialect ] & in the Eastern Cape [ Boer dialect ] but also notes that some of those differences were lost to the standardization process of the early 20th cent when the Cape Dutch in effect began to impose a standardized version. From : The Boers of Southern Africa. Arthur Kemp. The Boers that emerged on African soil abandoned the various languages their ancestors spoke [ ie: High Dutch / Low German / French / Frankonish / Provencal / German / Portuguese etc. ] & adopted as well as helped create the emerging Afrikaans language that developed on African soil to the point of creating their own dialect. Great Trek Was Not From Cape Town. There are some folks who often erroneously presume that the Great Trek of the 19th cent was from Cape Town [ as noted by the author cited in source # 17 of: The Cape Rebels Were Not Cape Dutch. ] when in fact the Great Trek was virtually entirely from the Cape frontier where the Boer population had developed at least 150 years prior. This confusion likely arises from the fact that the centennial celebration of the Great Trek was organized to start at Cape Town but that did not reflect the true history concerning the matter. One of the main reasons for recreating the Great Trek as starting at Cape Town during the centennial celebrations was no doubt to foster a monolithic Afrikaner identity so as to cover up the distinct Boer identity of the participants of the Great Trek. The Boer people of the frontier were much more prone to trek [ & in fact had a long history of trekking ] due to their long standing anti-colonial outlook & desire for independence & freedom on the African continent. This outlook was not shared by the Cape Town & Cape Dutch population.